A couple of days ago I turned in my next arts column for The Philosopher's Magazine, a review of the movie Avatar. The very same day, I received an alert that there is to be an Avatar and Philosophy volume in Blackwell's Philosophy and Pop Culture series. So that tells you the movie gets the philosophical juices flowing...a bit. But does it, really? On the face of it, the movie is about indigenous rights, the value of nature, and the like--good stuff! Unfortunately, James Cameron treats all these things in such a Disneyfied way that one's brain is not exactly put in overdrive. But come on, it was gorgeous and it was fun! Er... I have to admit (don't tell anyone) that I fell asleep for a minute or two in the first 20 minutes. I think that was because I had a sinking feeling I knew exactly how the plot was going to unfold for the rest of the movie (and I was right). Plus, that wondrously green and holistic world of Pandora did have a soothing effect...zzzzzz....as amazingly wrought and beautiful as it was (especially through 3D glasses). Evidently the smart people at Blackwell think the movie could inspire a pile of philosophical essays but I can't quite see it. What would they be about? Avatar is being discussed here. I haven't seen the movie myself, but from what you say, Jean, and from what I read elsewhere, I don't think that I will, but then again, I never go to the movies. I'll never understand why Cameron doesn't hire scriptwriters for his movies. There's no doubt that the man has "visually stunning" down pat. But as a screenwriter, well, he's a helluva producer. I suspect his view of his writing ability (or lack thereof) is blocked out by his enormous ego. I haven't seen Avatar yet on account of my flu.... but I plan on seeing it tomorrow. So I can give you a better idea of the wonderful philosophical insights that I can gleam from the movie... but off the top of my head, I think there is quite a lot to be said about identity, consciousness, environmental ethics, and such. Tom - Why do you think Cameron's movies are poorly written? I might be blinded a bit here, because I think I've loved every single movie that he's ever made without exception. Aliens, The Abyss, The Terminator, T2, Titanic.... People have been complaining about the plot of this particular movie, but then again, aren't all movies really the one of 7 archetypes, and its the details that make the difference? 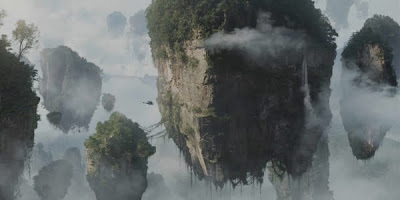 It is an unfortunate feature of Avatar that it raises many philosophical points very suggestively, but does absolutely nothing to explore them textually. With "The Matrix," one could actually quote bits from the movie as a launching point for philosophical commentary. With Avatar there is virtually no dialog that gets you going. Nevertheless, there are interesting ideas: identity transposition, distributed neural networks having consciousness, and so forth. If there is a central philsophical theme to Avatar it is this: that of extended mind. The mind in Avatar is malleable, extensible, and transposable. It can be sent into other bodies, and once there it can be extended into other minds. It can be uploaded into a multi-mind network, or moved permanantly from one body to another. In addition to this view of the mind as a transposable unity, the film suggests a particular kind of leftist ideology that is anti-corporate, pro-ecology, but also interstingly pro honor culture (can be viewed as reactionary). These ideological elements can be made to interface in various ways with the extended mind stuff at the center of the movie. So I can definitely see writing some stuff about that movie, but it's not comming out of the script, but the world creation backdrop. And the visuals were freaking aweseome. And if you are a James Cameron fan, which I am, minus Titanic and True Lies (which was a great action film but had vomit inducing ideology) there were fun Cameron references. Yes, the visuals are totally awesome. Wayne, make sure you go to a 3D showing! Faust...OK, that's good! Yes, extended mind, but you're right about why that's easy to miss as a theme. The plot and dialog don't do much with that. By the way, we are having a robot film festival in our house and we just watched Terminator 1 and 2. Violence was never as fun. I'll be back. As in "I'll be back" (Arnie voice). Terminator is great but Aliens is my favorite by quite a bit. Re: Avatar, if you ever do write about it for whatever reason, there is a book that James Cameron had made in conjunction with the movie that details the technology, physics and biology of the world in a fair ammount of detail. I haven't had a chance to look at it directly, but I read some excerpts and it seemed to me that there was a lot more meat there than in the movie in terms of philosophical potential. Saw Avatar. Loved it! Thinking about what to pitch for the Avatar and philosophy volume. Maybe something about feminist ethics or animal rights. I trust you received that email alert--it contained lots of topic suggestions. Glad you liked it. Despite my grumblings, I was by all means much fun. Sorry to be slow in responding. Tastes, vary of course, but I find Cameron's writing to be long on formula and Hollywood zingers and short on character development and interesting plot twists. I thought *Titanic* was particularly poorly written. Tom- Hmm... Titanic is a tougher cookie, since the setting of the story almost requires people to be stereotypical. The Bourgeois and Steerage, etc. So everyone is really supposed to stay static, with the exception of Rose, who does develop quite a bit through the story. Cameron has a way of picking up on the resonance of particular lines and grinding them into the ground sometimes. "I'll never let go" gets the treatment in Titanic, "I see you" gets the treatment in Avatar. I'll admit that is a little annoying. But watching Avatar and Titanic, I at least, really get lost in the world of the movie that Cameron creates. I think that is a particularly difficult thing to do, and he pulls it off with relative ease, to the point that I didn't realize either was a three hour movie. An interesting (and basically positive) view of Avatar from George Monbiot.